Fewer people, however, are familiar with the Mariana Islands—a chain of 15 islands that include ten uninhabited volcanic islands to the north and five limestone islands to the south. The Marianas are divided into two political regions: the Commonwealth of the Northern Mariana Islands (a Commonwealth of the United States comprising Saipan, Tinian, and Rota) and Guam (a US territory). Fringing the coasts of each of these islands are lush coral reefs that support indigenous fishing and a large tourism economy, including many ecotourism opportunities. 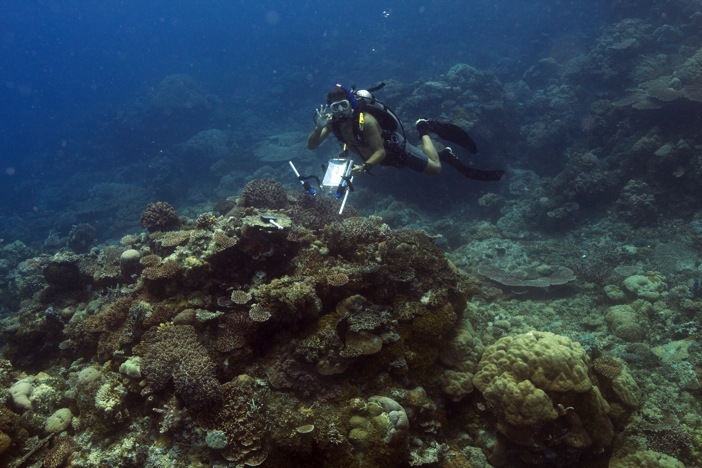 For six weeks in April and May, the coral reefs of the Mariana Islands also supported a cadre of scientists deploying instruments and collecting data as part of NASA’s COral Reef Airborne Laboratory (CORAL) mission. 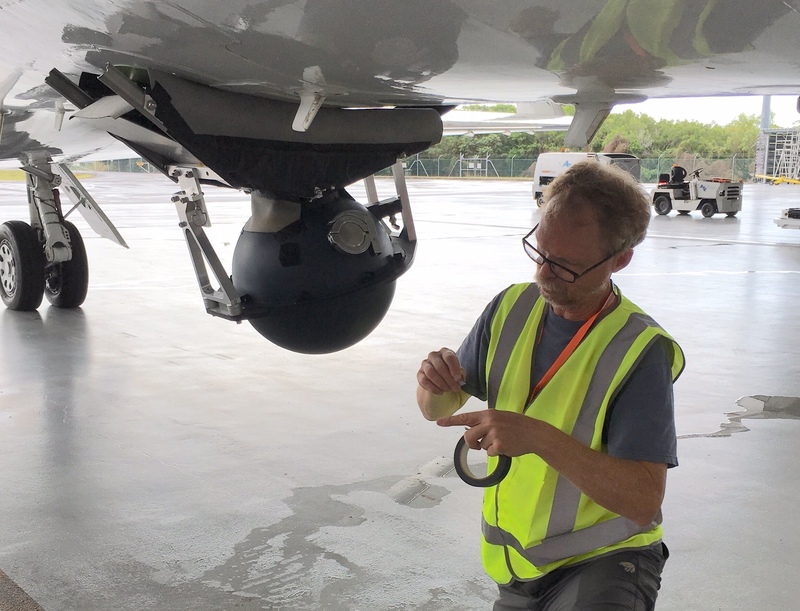 Using a state-of-the-art sensor—the Portable Remote Imaging Spectrometer (or PRISM)—housed in a Gulfstream-IV airplane, CORAL will provide a new perspective on the function and future of coral reef ecosystems. The data collected by PRISM, and validated through extensive in-situ (or in-water) measurements in the field, will form a series of maps that indicate the relative densities of coral, sand, and algae in each study area, as well as rates of primary productivity (the creation of new organic material) and calcification (the process by which reefs produce calcium carbonate, an important determinant of reef health). With these maps, the CORAL team can build models to help scientists, resource managers, and politicians better predict how reefs are impacted by both natural and human processes. While in Guam, the three in-water validation teams surveyed 65 benthic cover sites (from which high-resolution photo-mosaics will be produced, allowing for detailed analysis of the various types of seafloor, or benthic, habitats), 6 metabolism gradient flux sites (which reveal information about reef productivity), 1 metabolism Lagrangian site (with instruments that measure reef productivity and calcification in a set mass of water, over a specific amount of time, along a set transect across the reef), and 42 water optical property sites (which yield information on how light travels through the water column, from the surface to the seafloor and back). 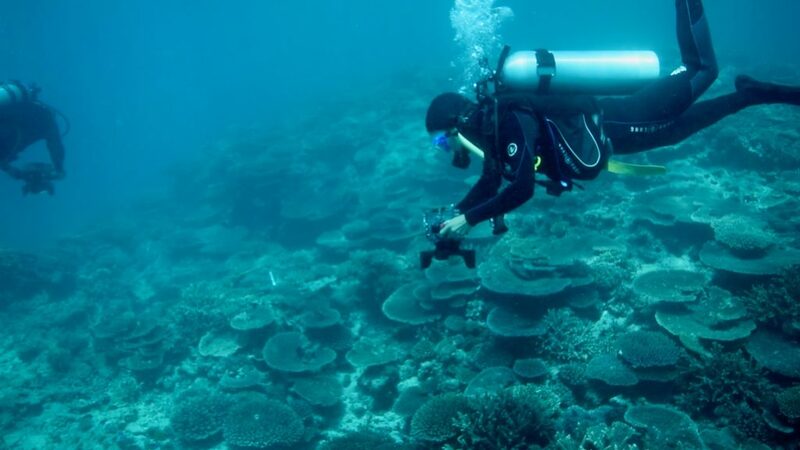 Having spent a significant amount of time doing underwater surveys in Guam during the mid-2000s, Eric Hochberg, an associate scientist at the Bermuda Institute of Ocean Sciences and the CORAL principal investigator, was pleased to see the reefs looking much the same as they did a decade ago. 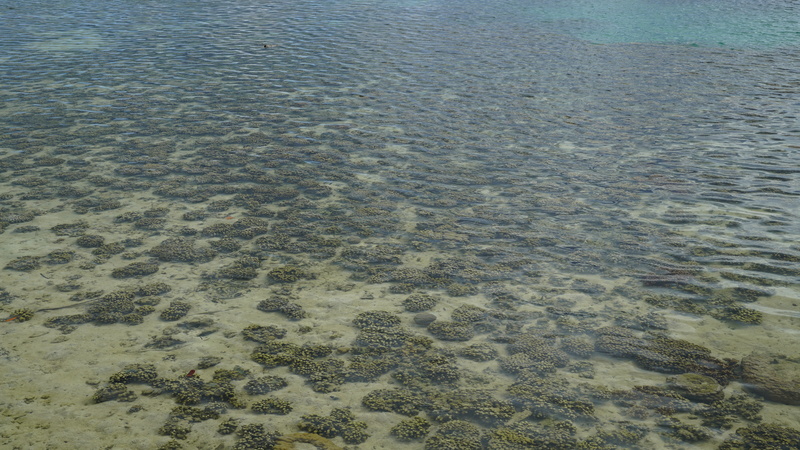 In Palau, the field teams surveyed 74 benthic cover sites, 10 metabolism gradient flux sites, 2 metabolism Lagrangian sites, and 52 water optical property sites. In addition, 23 sites were studied with an underwater spectrometer to collect measurements of benthic reflectance, or the amount of light that is reflected from the seafloor back to the ocean surface. Each benthic community—in this case coral, sand, and algae—has a different spectral “signature” (how much light is reflected as a function of wavelength), which means that measurements of benthic reflectance can be used to identify the composition of the seafloor. The reefs in Palau lived up to their billing, providing a stunning natural backdrop for the CORAL survey work being conducted. 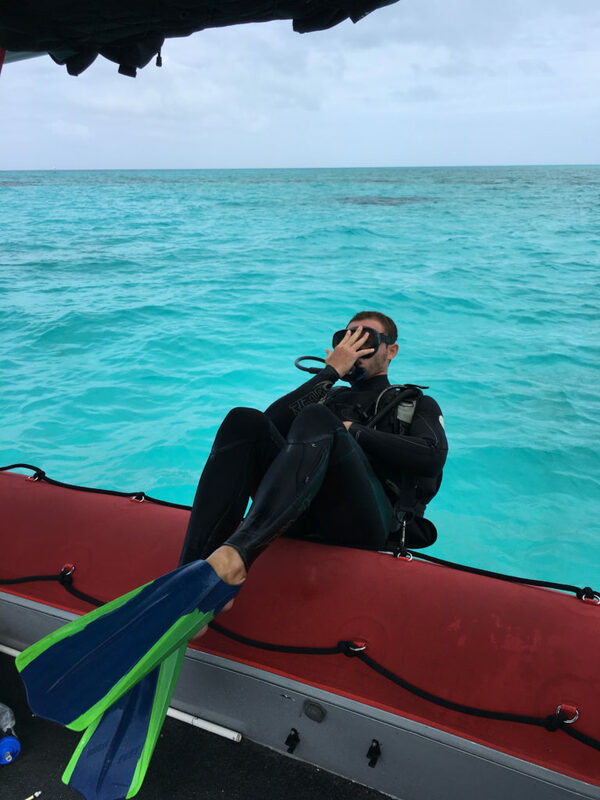 Stacy Peltier, a research technician in Hochberg’s lab at BIOS and part of the CORAL benthic team, said the reefs there were a completely new experience for her. 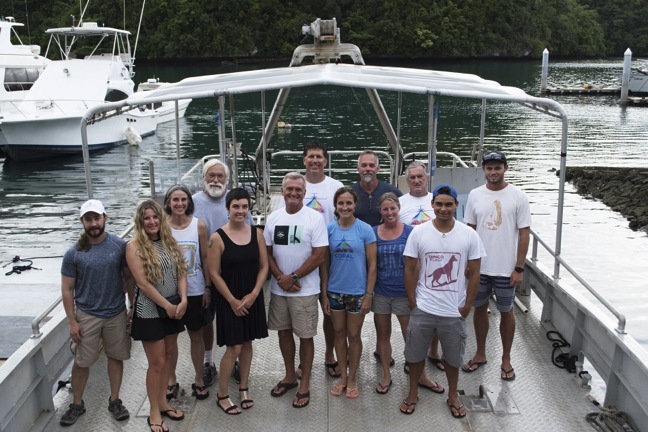 And, unlike in Guam, the CORAL team had access to dedicated facilities and research vessels in Palau courtesy of the Coral Reef Research Foundation and the dynamic husband-and-wife team of Pat and Lori Colin, the foundation’s director and laboratory manager/research biologist, respectively. 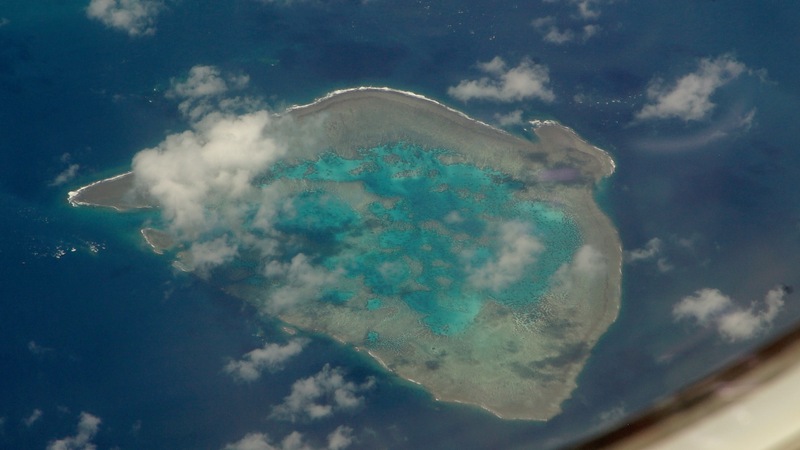 The airplane carrying the PRISM instrument shuttled between bases of operation on Guam, Yap (part of the Federated States of Micronesia), and Palau, allowing the flight team to take advantage of shifting weather windows in each region. Over the six-week campaign a total of 75 flight lines were collected, representing at least partial coverage of reef areas in Guam, Rota, Tinian, Saipan, Farallon de Medinilla, Anatahan, Guguan, Alamagan, Pagan, Asuncion, Maug, Farallon de Pajaros, and Palau. 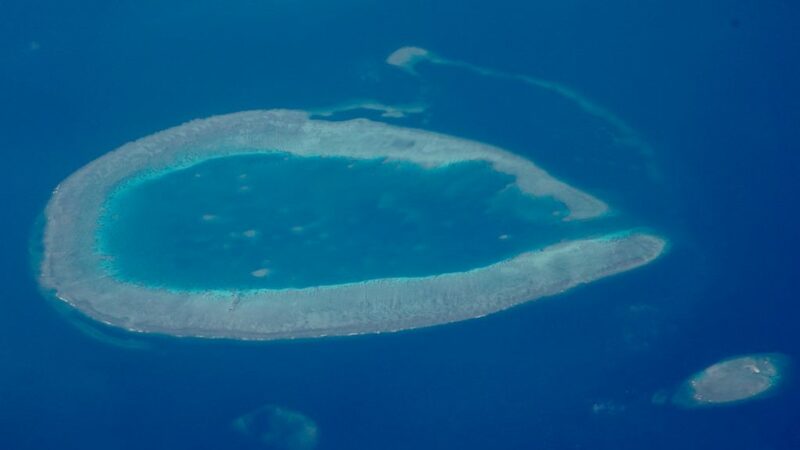 With the campaign in the western Pacific complete, and with flight hours remaining, the CORAL investigation ended on a high note by flying PRISM over reef tracts in the Florida Keys. This “bonus reef” is the first CORAL data set from the Atlantic Ocean and will serve as another representative reef area in terms of reef type, physical forcings, human threats, and biodiversity. The field and airborne teams have returned to their respective home institutions and the CORAL project is now moving into the data processing and analysis phase, which will extend into 2018. CORAL datasets and data products are publicly available. For more information, please visit www.coral.bios.edu/data, which will be updated as data become available, and www.coral.jpl.nasa.gov. 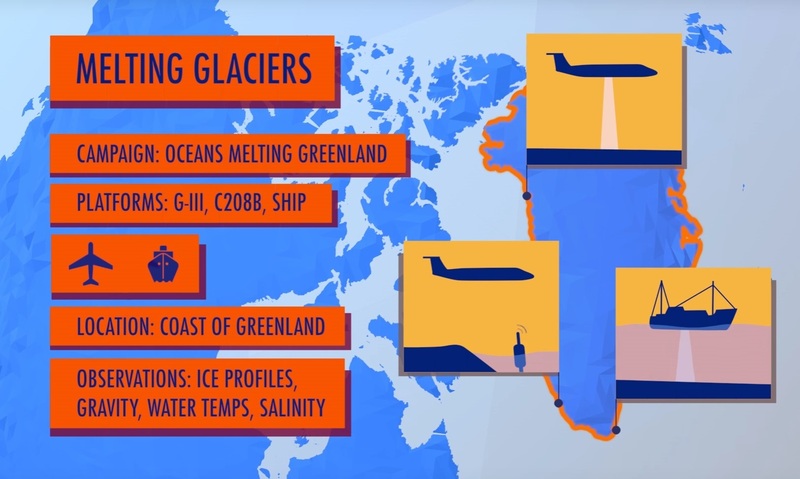 Understanding our planet and how it functions, as well as the impacts that human activities have on it, requires frequent and extended forays into the field to yield valuable data and observations. 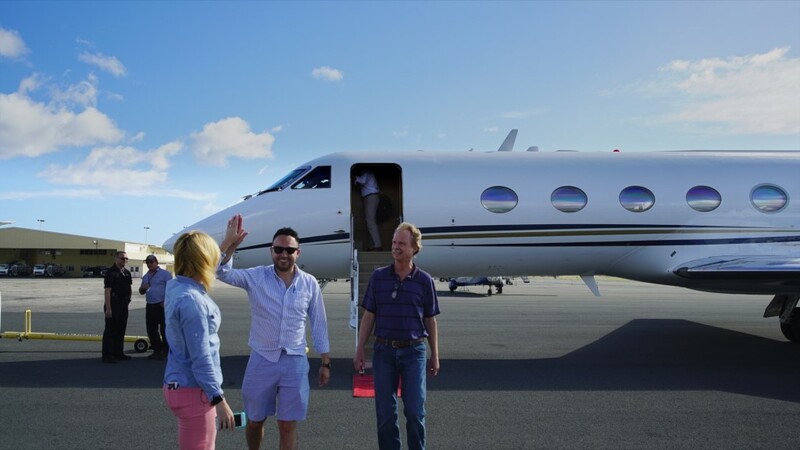 The COral Reef Airborne Laboratory (CORAL) investigation is a prime example. The three-year mission, funded by the NASA Earth Venture Suborbital-2 program, is conducting airborne remote sensing campaigns, along with in-water field validation activities, across four coral reef regions in the western and central Pacific Ocean. When CORAL traveled to Hawai‘i last month for its second field campaign, it already had nearly a year of the mission under its belt. The Operational Readiness Test (ORT) took place in Hawai‘i last summer and the team completed a successful first field campaign in Australia’s Great Barrier Reef last fall. During both, communications between the airborne and field teams were streamlined, field operations and equipment deployments were tested and refined, and team members gained valuable experience working with both equipment and each other. Even with years of planning and preparation, however, such ventures are always undertaken with the knowledge that some variables are out of the researchers’ control. For the CORAL team, there was one thing they couldn’t prepare for in Hawai‘i: the weather. While the in-water field teams can—and do—work in what are often considered adverse conditions, the weather can still take a toll on the instruments left in the water to collect data. Unlike the in-water teams, the airborne operations for CORAL require substantially fairer conditions. 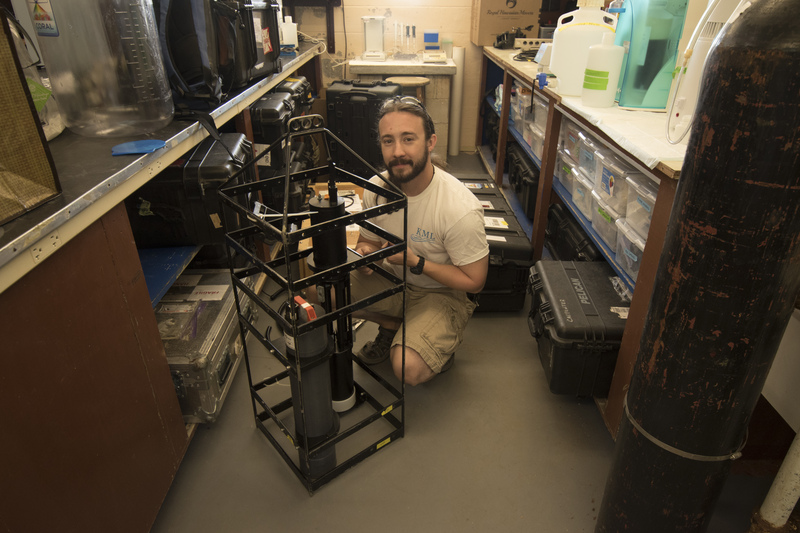 The PRISM (Portable Remote Imaging Spectrometer) instrument that forms the backbone of the CORAL science is housed in the belly of a Gulfstream-IV airplane that flies over survey areas at an altitude of 28,000 feet. In order to obtain the most accurate spectral data possible from the seafloor, the airplane must fly in relatively cloudless skies with low surface winds over clear waters. CORAL scientists also had to contend with a significant rain event over the region in late February as a slow-moving storm system dumped rain on the islands for two straight days and caused urban flooding in many areas. These floodwaters, originating on land and emptying into the surrounding ocean, led to a significant amount of soil runoff in areas. The additional sediment in the waters reduced water clarity and, as a result, impacted the ability of the PRISM instrument to “see through” the water to the seafloor. Despite these challenges, the CORAL team was able to complete in-water validation activities in Kāneʻohe Bay and collect flight lines over the Big Island (the island of Hawai‘i), Maui, O‘ahu, Kaua‘i, Ni‘ihau, Moloka‘i, Lana‘i, and Kaho‘olawe. The benthic team also visited Maui and the Big Island to gather data for various benthic communities not represented in Kāneʻohe Bay. The boat stops to look at an area more closely. “It’s looking pretty algalicious here,” says Carpenter with a laugh, knowing he just made up a word. He asks skipper Sam Ginther, a research technician at California State University, Northridge, where Carpenter is a professor of biology, to continue to another location. 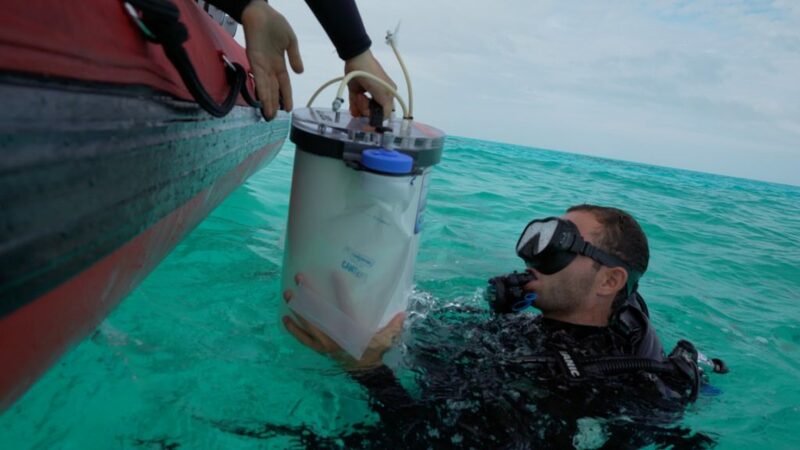 Carpenter has brought his three-person team to the Great Barrier Reef to make in-water measurements of the productivity and calcification of the community of living organisms found on the seafloor here at Heron Island and also at Lizard Island, on the northern Great Barrier Reef. 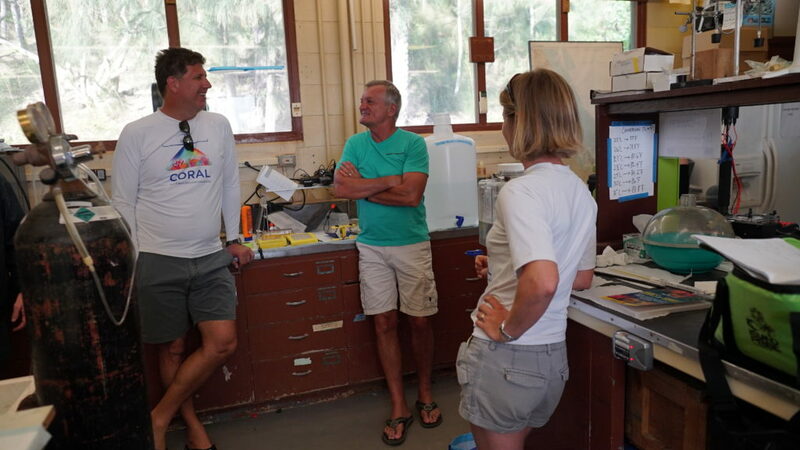 Their data will help the CORAL team validate CORAL’s advanced Level 4 science products. It’s mid-September and day two out in the field for the team at Heron. 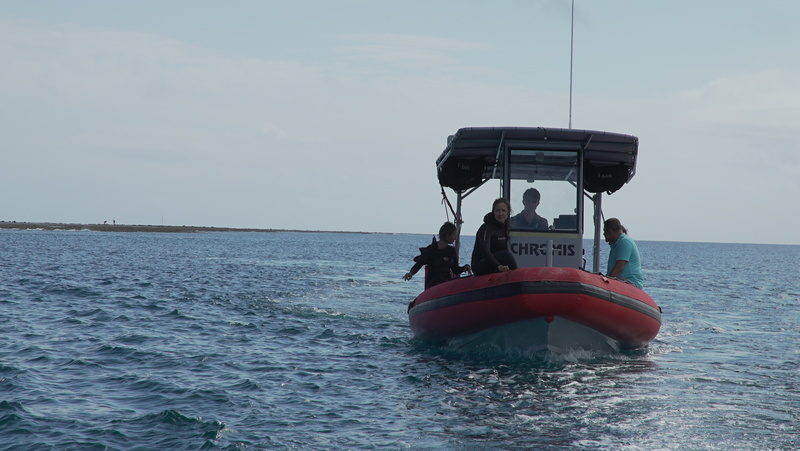 They’ll be here for another week, installing instruments at up to 10 sites around Heron Reef. Yesterday they deployed a float called a drogue to track the paths of currents below the water surface to help guide their placement of instruments. On today’s trip they’ll be deploying two types of instruments: samplers that collect water for later analysis in the lab, and gradient flux instruments that measure oxygen and water flow. At this location they are deploying the “gradient flux” instruments. The instruments will measure two of the three key aspects of reef metabolism his team is studying: primary productivity and respiration (the third is calcification). Metabolism refers to the processes by which reef communities acquire energy for growth and build their limestone skeletons. The team must work quickly, because the high and low tides here at this time of the month are extreme. “I think the difference at this time of day is 7.2 feet, so we need to get out to the lagoon when it’s high tide so we’ll have deep enough water to navigate in when we’re entering the lagoon and going over the reef crest,” says Chiara Pisapia, a postdoctoral researcher from Italy who came to Australia six years ago and recently completed her postdoc at James Cook University. She’s now joining Bob’s group at CSUN. “If we’re still in the lagoon when the tide goes down, we’ll be stuck here until the next high tide.” The team will have a little more than two hours in the lagoon, which averages about 11 feet in depth, to accomplish today’s tasks. The instruments have to be placed where they won’t go dry when the tide goes out. The gradient flux system—oxygen sensors and acoustic Doppler velocimeters—will be mounted at two heights above the seafloor. The bottom instruments are placed 4 inches above the flora and fauna on the seafloor, with the top instruments placed 43 inches above the seafloor. The method they’re using relies on the flow of water to carry water and oxygen (either produced by photosynthesis or taken up by respiration) past the instruments. 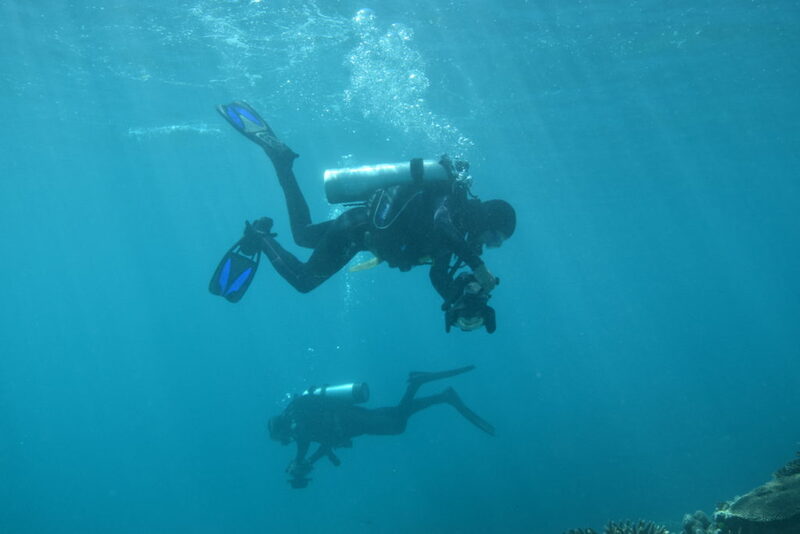 The team locates a suitable spot in the lagoon and gets to work, donning scuba gear and taking the equipment they will need down to the seafloor below. The equipment includes a tall cylindrical stand with adjustable brackets and clamps that hold the four gradient flux instruments in place at fixed heights to eliminate any bias in the measurements. Bob Carpenter and Sam Ginther, both of California State University, Northridge, set up gradient flux instruments. Credit: Chiara Pisapia. 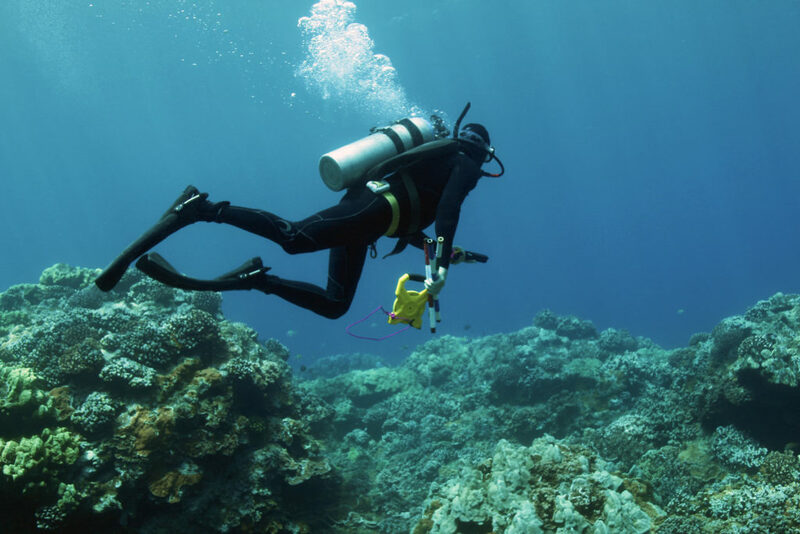 The sensors will continuously measure oxygen and water flow across the layer of water directly above the organism-covered seafloor, providing measurements of the area’s net productivity during the day and its respiration at night. 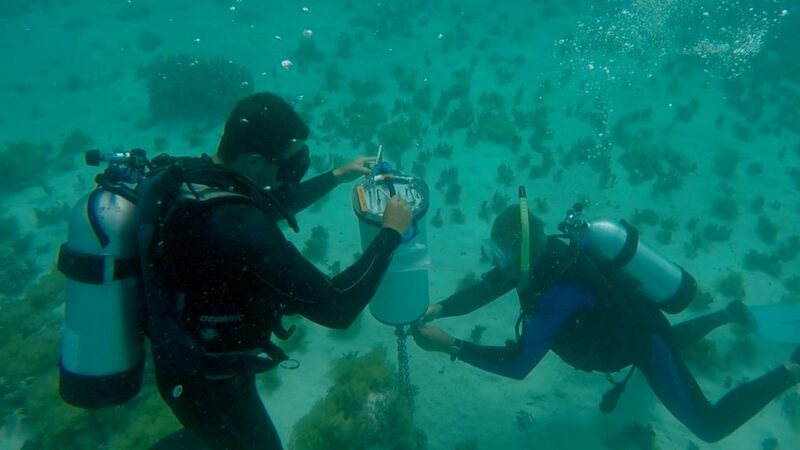 Upon completing the installation, the divers release a special yellowish-green, reef-safe dye, which allows them to verify that water is flowing across the instruments. A member of the team notes the location of the installation using a portable GPS receiver. The team will repeat the process tomorrow, moving the instruments to a new location on the reef every 24 hours. Earlier in the day, the team used GPS coordinates to locate instruments they installed in the lagoon yesterday that are used to measure reef metabolism, and placed two CSUN-built integrated water samplers at the same locations. The water samplers were placed about 1,312 feet apart, one downstream from the other, moored to the seafloor. They remain in place for five consecutive days. “The water samplers take tiny little sips of water—only about 3 or 4 milliliters a minute—and they do that for six hours, so you get this long-term water sample, and we do that at both ends of the transect, and then we can come out tomorrow and collect the samples from the sample bags,” Carpenter says. The team swaps the sample bags out and takes them back to the lab to analyze for total alkalinity. Changes in total alkalinity can be used to estimate reef calcification, a key element of reef metabolism. Calcification is the secretion of calcium carbonate—what we think of as limestone. Coral skeletons and other calcifying organisms such as calcified algae build the reef framework, allowing reef systems to grow vertically over time to create the largest biogenic structures on Earth. 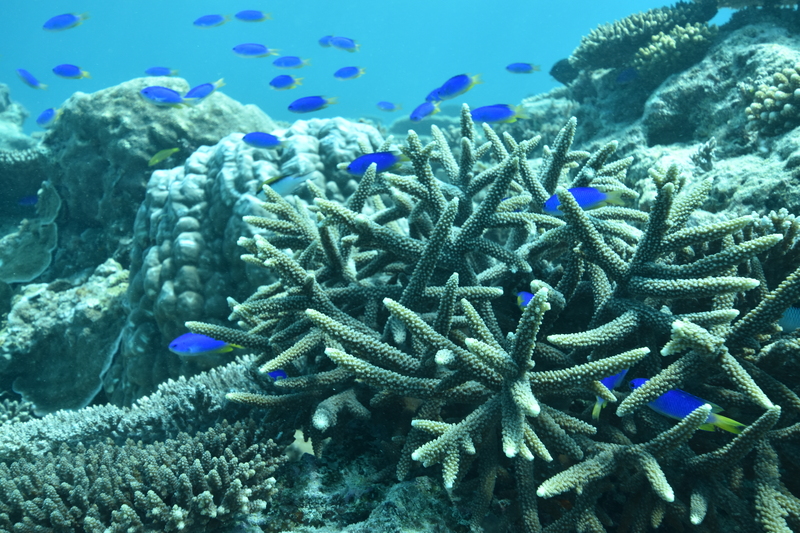 The process of calcification is fundamental to the growth of corals and reefs in general. As climate changes and sea surface temperature and ocean acidification increase, calcification is predicted to decrease. In fact, experiments are showing that calcification decreases with simulated increases in ocean acidification and temperature. Their work for the day complete, Pisapia takes the helm and carefully navigates the boat through the shallow corals out of the lagoon and back to the harbor. Tomorrow they’ll go out again and move another set of instruments. Their work here on Heron Island will be followed by several months of data processing and analysis. 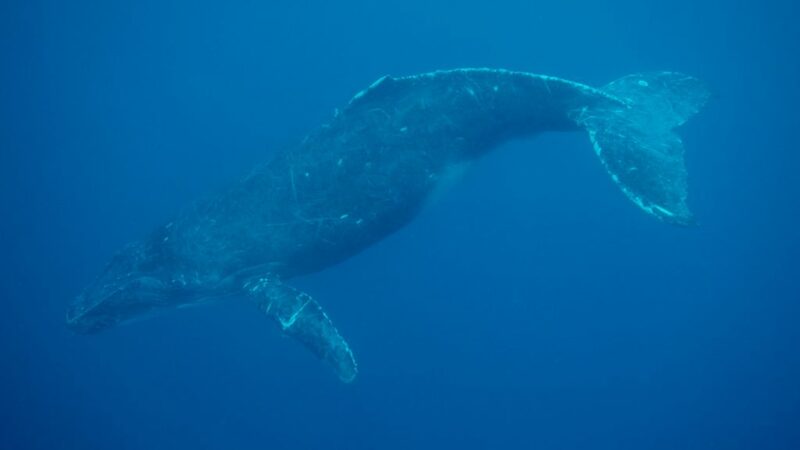 As they head for shore, a large humpback whale and her calf breach out of the water a short distance away. They stop for a minute to watch in awe. Life is good. 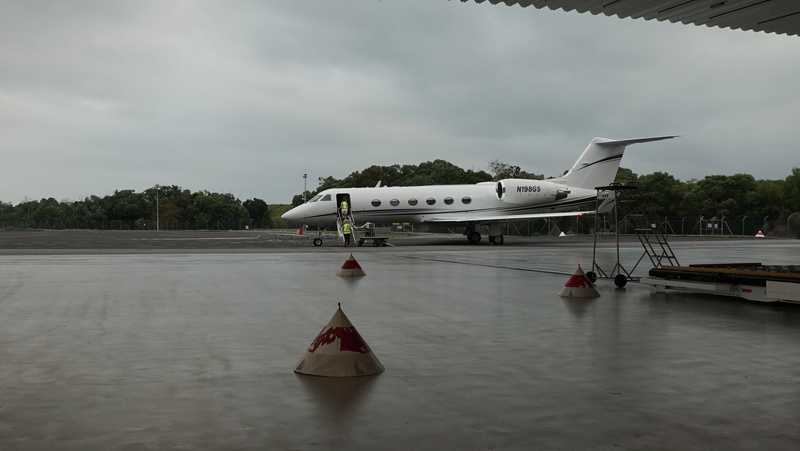 My heart races as I sit snugly buckled in the leather seat of our modified Tempus Applied Solutions Gulfstream IV aircraft on the runway at Australia’s Cairns Airport. For NASA’s COral Reef Airborne Laboratory (CORAL) team, the anticipation is palpable – after days of weather delays, would this be the day we get airborne again? Soon I hear the engines roar to life, and we bolt down the runway, faster than any plane I’ve ever flown in before. We go airborne and climb sharply through mostly cloudy skies, then bank left and head south over the Coral Sea. It’s 8:54 a.m. Australian Eastern Standard Time on Sept. 15. Within minutes the Great Barrier Reef comes into view, in all its stunningly beautiful majesty. A shimmering, luminescent spectacle in shades of aquamarine, turquoise, cyan, white and more, the sight of the massive reef is enough to move one to tears. First a long crescent appeared, fringed by whitecaps, then a wispy auradescent amoeba. As we head farther from the coast, more reef structures appear in an array of sizes and shapes, their sight obscured at times by pockets of clouds. Above us, the sky shines blue and bright; below, clouds dot the seascape. We’re on our way. It’s hard to imagine that less than three hours ago, as the team assembled for a 6 a.m. weather briefing, the odds of flying seemed uncertain at best due to clouds looming off the coast. Clouds are the enemy of CORAL’s Portable Remote Imaging Spectrometer (PRISM), developed by NASA’s Jet Propulsion Laboratory in Pasadena, California. 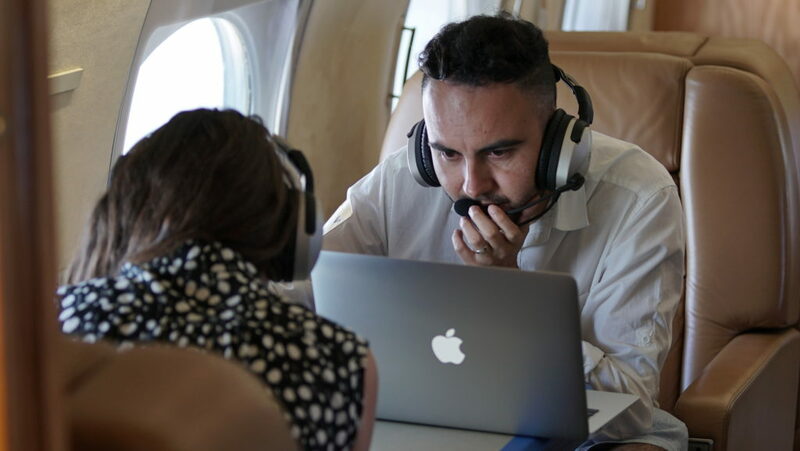 CORAL will investigate the condition of the Great Barrier Reef and representative reef systems worldwide from its airborne perch 28,000 feet (8,500 meters) above sea level. 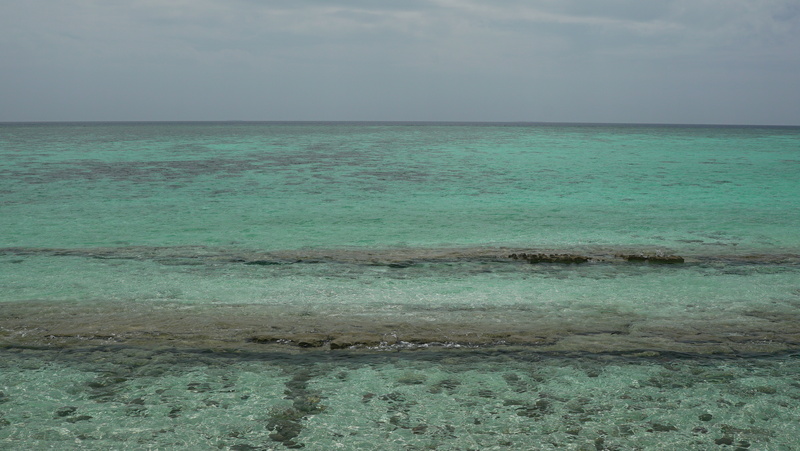 For the past several days, clouds had grounded the CORAL team. Hovering above a laptop computer in an office at the plane’s hangar, CORAL project system engineer and mission campaign manager Ernesto Diaz and NASA CORAL project scientist Michelle Gierach, both of JPL, reviewed an animated sequence of satellite cloud imagery. Other members of the team watched or listened in by phone. To the south, the images revealed pockets of clearing over some of CORAL’s target areas. But would the clearing hold for the several-hour duration of a flight? On the phone Stuart Phinn, professor of geography at the University of Queensland, recommended flying, as the forecast for the next few days was only going to get worse. After further discussion, Diaz recommended the team reconvene at 8 a.m. to make a final go/no-go decision and instructed pilots Josh Meyer and Curt Olds to tow the plane to the tarmac. He also asked the PRISM team to begin preparing for flight. The five-member JPL team aboard the flight – Diaz, optical engineer Holly Bender, lead technician Scott Nolte, JPL videographer Jim Round and I – boarded the aircraft. As the clock ticked, conditions remained marginal. Finally, it was 8 a.m., and the team convened again by phone. The clear patches to the south had remained. After a few more minutes of discussion, Diaz said, “We are a go.” The target area for today was a region of the Great Barrier Reef near Mackay. 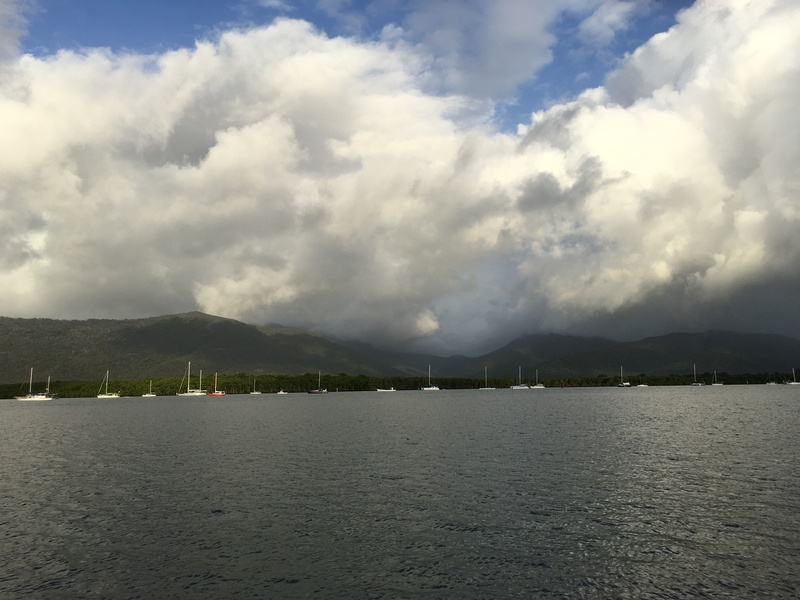 Returning to present time, we head south along the Queensland coastline. 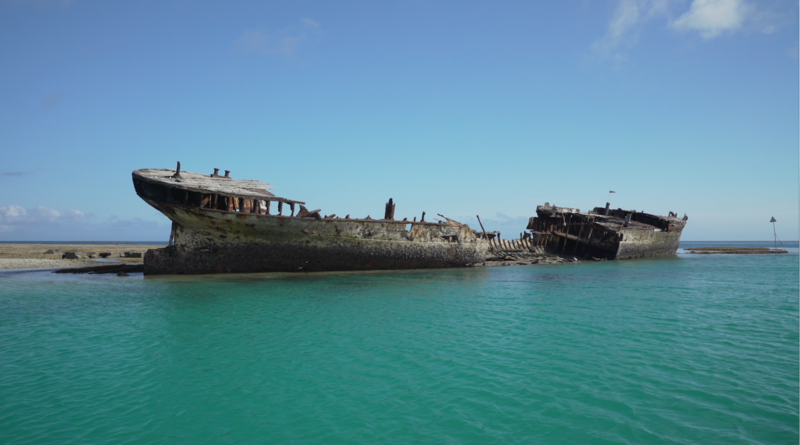 It will take about an hour to reach Mackay, located on the south central portion of the reef. The team has targeted up to 20 flight lines to survey with PRISM today out of the CORAL campaign’s planned 151 flight lines over the reef. Our total flight time is expected to be up to five hours (two hours if the weather doesn’t hold when en route). Diaz and Bender spend the early part of the flight ensuring that PRISM’s flight tracker is set up and jotting down flight lines, while Nolte monitor’s PRISM’s performance. The crew all wear headsets to facilitate communication between themselves and the pilots. PRISM’s focal plane temperature slowly begins to stabilize and eventually reaches its nominal 0 degrees Celsius (32 degrees Fahrenheit). Nolte also monitors the temperature inside the PRISM telescope and the pressure between the vacuum vessel. Thus far, everything looks normal. We continue heading south, paralleling the Queensland coast, toward our destination about 375 miles (604 kilometers) south of Cairns, a bit more than the distance between Los Angeles and San Francisco. I ask Diaz and Bender what’s going through their minds at this point in the flight. This is essentially a training flight for Bender—the job of collecting PRISM CORAL data is normally a two-person job. The CORAL team members work in two-week stints. Heading farther down the coast, the city of Townsville appears below along an irregular coastline. To the west, Australia’s vast interior is largely hidden beneath cloud cover. 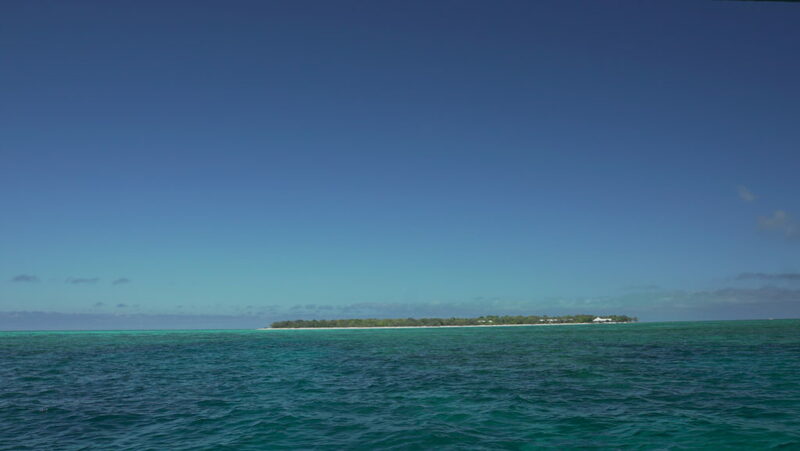 To the left, a large, mostly cloud-free area opens up, with scattered islands piercing the sea surface. As the team reaches the first target region, they find a mix of cloud cover but it is within acceptable limits. They decide to begin collecting data along their first flight line. A beeping sound from the flight planning tool that sounds something like a percolating coffee pot begins signaling that PRISM is collecting data, in a ground swath measuring 3 miles (4.75 kilometers). They complete the data collection, then maneuver the plane to its next target line, then a third. As they assess the three lines collected, portions of the lines appear cloud-free, while others have 100 percent cloud cover. The team makes a real-time decision about whether to proceed to the next nearest flight line or skip it in favor of one with less cloud cover. The aerial survey “mows the lawn,” so to speak, as the plane flies back and forth across target regions that have about a 15 percent overlap. 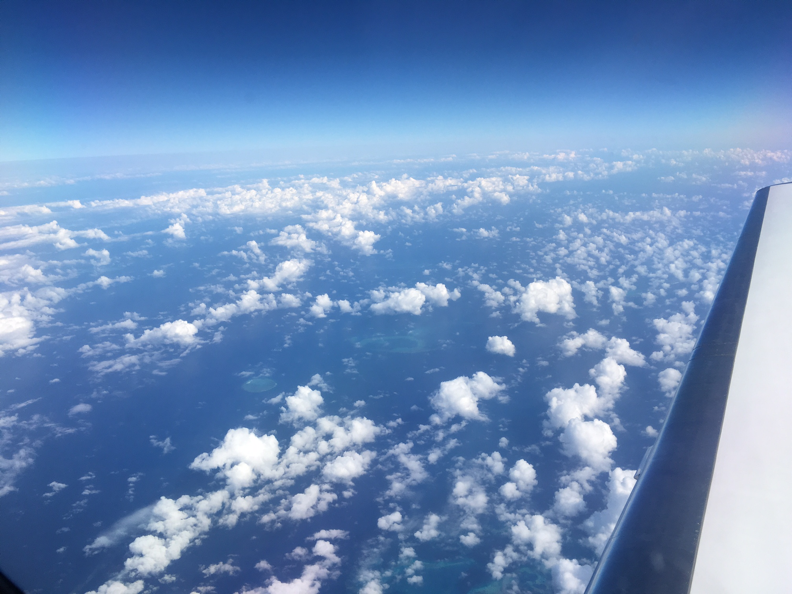 Adjacent target flight lines may be in a completely different direction—CORAL scientists target representative reefs across a transsect of the reef from the coastline to the outer reef. In the meantime, Nolte continues to monitor PRISM. His computer screen shows various data, including the plane’s pitch and roll and its heading, along with a visual of what PRISM sees and a more human-friendly view of the ocean below. As they continue collecting data, the decision to change the flight plan pans out as flight lines appear to be mostly cloud-free. The team decides to not collect data over some of the flight lines, either due to unfavorable cloud conditions or the sun’s angle above, which becomes increasingly unfavorable as the morning flight continues. “We have about three hours in the morning and three in the afternoon where there are ideal lighting conditions,” Bender says. After the team completes its 13th line, they decide to return to base. A future flight may collect the other lines. CORAL’s level one science requirement is to image at least half of the mission’s targeted sites. The plane touches down back in Cairns at 1:16 p.m., a little more than 4 hours after takeoff. 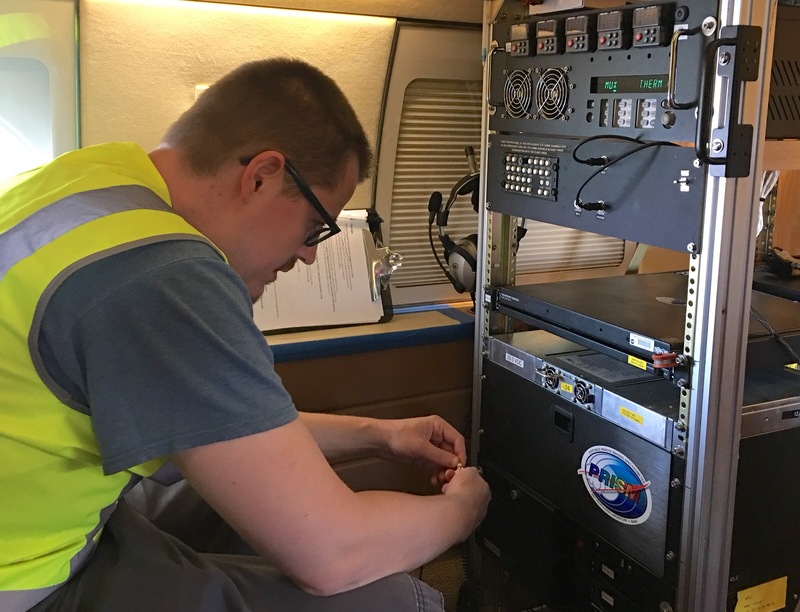 Following the flight, the team shut down the PRISM instrument, removed the nearly 500 gigabytes of data collected and transferred the data to a field server where data processing begins. Initial quick-look data providing a snapshot of what was mapped are typically available within a day—these can sometimes be used to plan the next day’s flight activities. Level one data products take an additional day. More advanced data products are processed off-site. 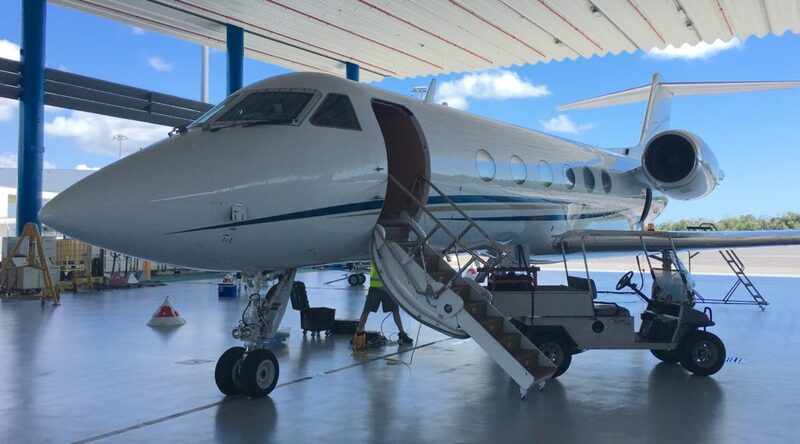 With the completion of the successful flight, the CORAL team has now collected about a fifth of the data planned for the Great Barrier Reef deployment. The team will remain in Australia through the end of October. On a non-flight day this week, I had a chance to chat with some of the crew from NASA’s Jet Propulsion Laboratory who are here in Australia to support the Coral Reef Airborne Laboratory’s (CORAL) Great Barrier Reef deployment about their roles in the mission. Ernesto Diaz is CORAL’s project system engineer and mission campaign manager. He joined JPL in 2010 and is currently in JPL’s imaging spectroscopy group, working on PRISM and other spectrometer instrument programs that are pathfinders to develop technology for a planned NASA satellite called the Hyperspectral Infrared Imager. Among Diaz’s responsibilities is to assess the weather each day to determine if a flight will be attempted. The team’s routine includes daily 6 a.m. weather assessment briefings. 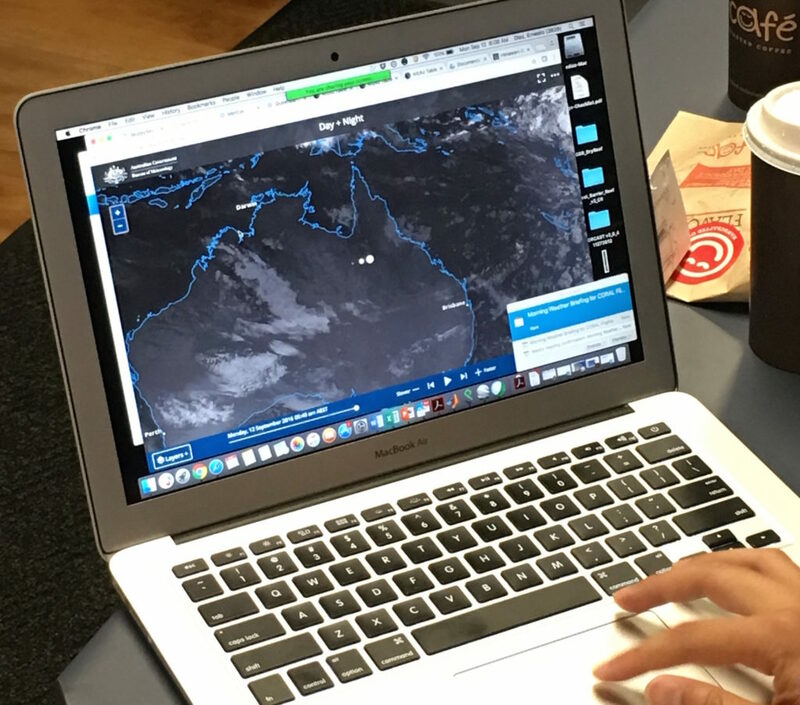 Diaz bases his assessments and recommendations on data from the Australian Bureau of Meteorology. Because PRISM is a passive imaging system, meaning that it records the amount of light energy reflected back to it from Earth’s surface, it requires a cloud-free view to the ground below. 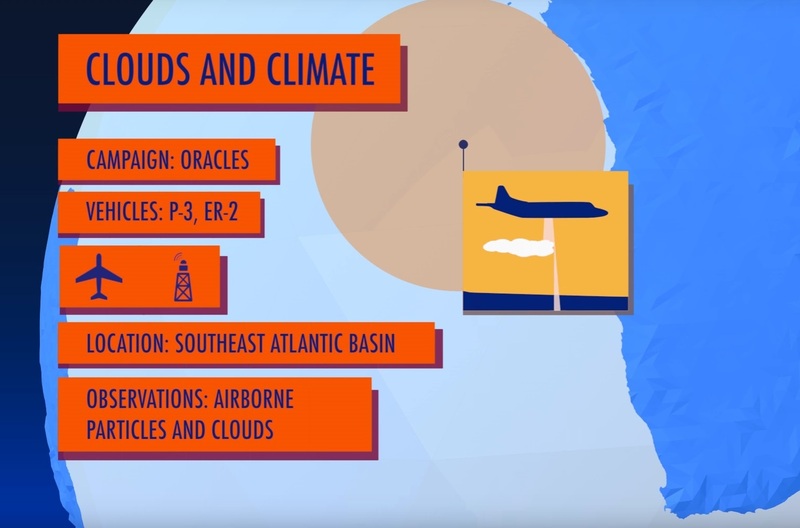 CORAL’s science requirements state that cloud cover over a target area must be less than 20 percent, including clouds both below and above the plane. Winds must also be light, because strong winds create chop on the sea surface that interferes with PRISM’s performance. Diaz said PRISM has two flight opportunities each day: one in the morning and one in the afternoon. On days when the initial 6 a.m. forecast looks favorable, the team is given a go to turn the PRISM instrument on. A second weather go/no-go call is then made at 8 a.m. prior to a takeoff at 8:30 a.m. Morning opportunities are typically better for winds. Diaz says CORAL is his favorite project since he’s been involved with it since its inception and he designed all the flight lines for the campaign. Imaging spectrometers have taken him not only to the Pacific, but to Chile and India as well. On the team’s day off this week, he and his wife went to Kuranda Koala Gardens, about 45 minutes north of Cairns, and got to hold and pet a koala. “It’s a perk of the job,” he said. Technician Scott Nolte built hardware for PRISM’s high-powered UNIX-based electronics subsystem, which has the highest signal-to-noise ratio performance of all of JPL’s imaging spectrometers. Nolte has worked at JPL for 33 years, 15 of them in the lab’s imaging spectroscopy group. He said he’s seen a lot of growth. 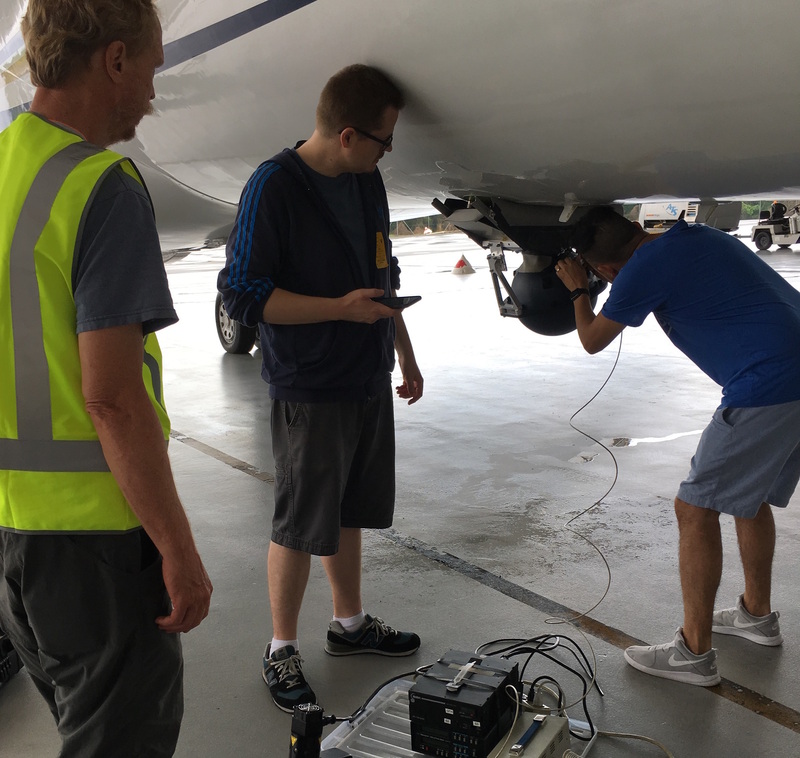 For Nolte, a typical day in the field with PRISM consists of cooling the instrument’s camera down and stabilizing its temperature two hours before takeoff, as well as any required troubleshooting as necessary. 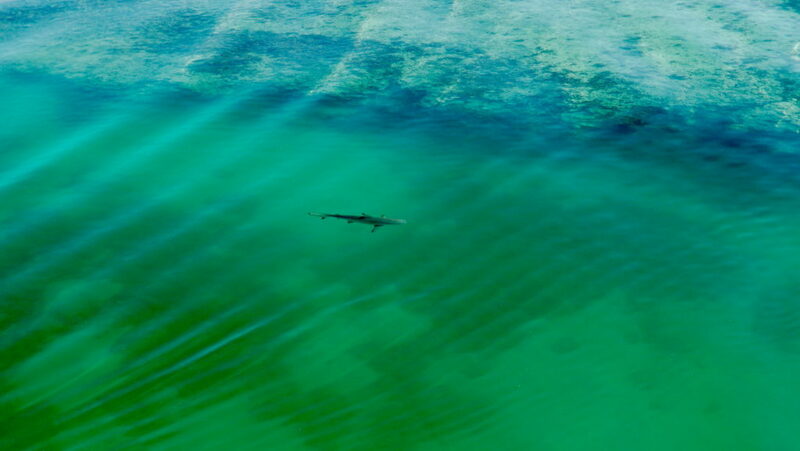 Nolte’s work has taken him to places like Hawaii; Norway; Punta Arenas, Chile; St. Croix; and Marathon in the Florida Keys. 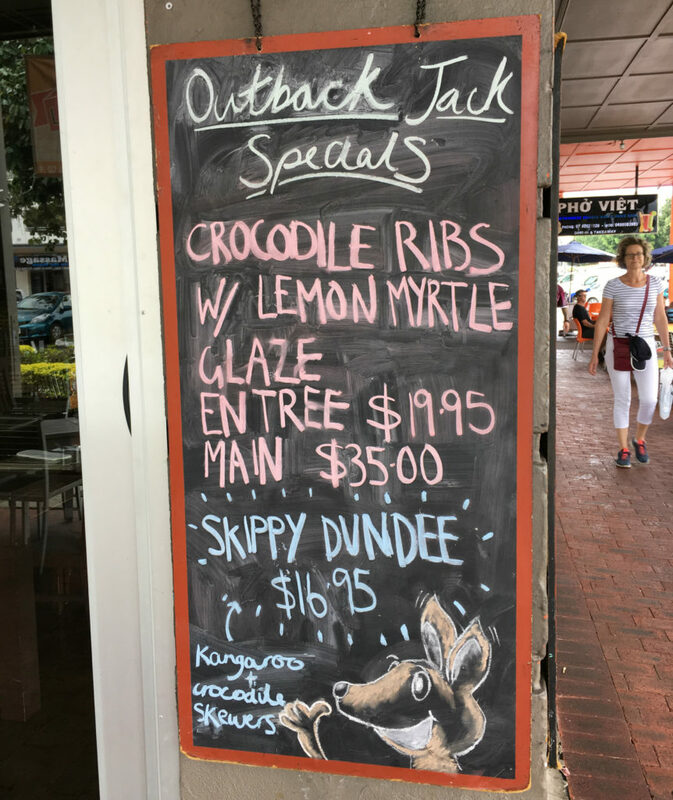 This is his first visit to Australia. “PRISM gets some pretty sweet deployments,” he said. Justin Haag is PRISM’s optical engineer. His job is to make sure the PRISM instrument is working and ready. The Illinois native and graduate of Northern Illinois University and UC San Diego joined JPL two years ago. When I caught up with Haag, he, Diaz and Nolte were making hardware adjustments to part of PRISM’s field health assessment kit. 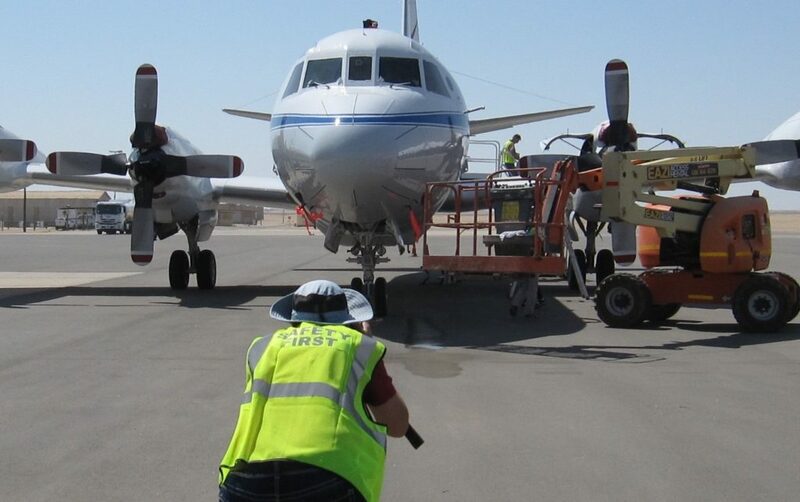 Unlike calibration tests, which are performed on PRISM both before and after its mission campaigns, the field health assessment kit is used to periodically assess PRISM’s performance between flights. 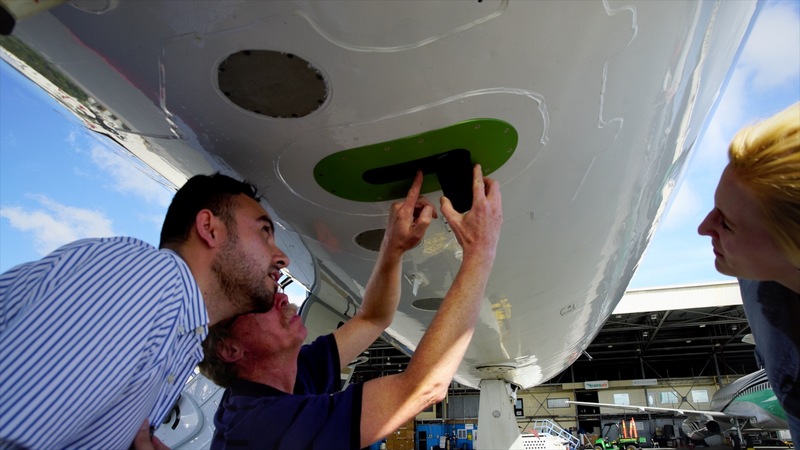 It consists of a sphere attached to PRISM’s external camera port on the exterior of the Gulfstream IV aircraft. Two different types of lamps are shined into the sphere, which bounces the light around the sphere’s white, coated interior to create a uniform light input for PRISM to measure. A previous health assessment test last week had detected some light leaking into the sphere through exterior gaps in the kit fixture’s hardware. The team’s solution? They covered the gaps with black tape. Think of it as an adult version of the arts and crafts we all did in elementary school. Not every problem requires a high-tech solution. Just a little old-fashioned ingenuity. And then the flight team waited for the weather to cooperate. And waited. And waited. A high five for a successful science flight. Michelle Gierach (left) greets Coral Reef Airborne Laboratory (CORAL) Project System Engineer Ernesto Diaz and Portable Remote Imaging Spectrometer (PRISM) Lead Technician Scott Nolte, all of NASA’s Jet Propulsion Laboratory, after its arrival June 19 at Honolulu International Airport. 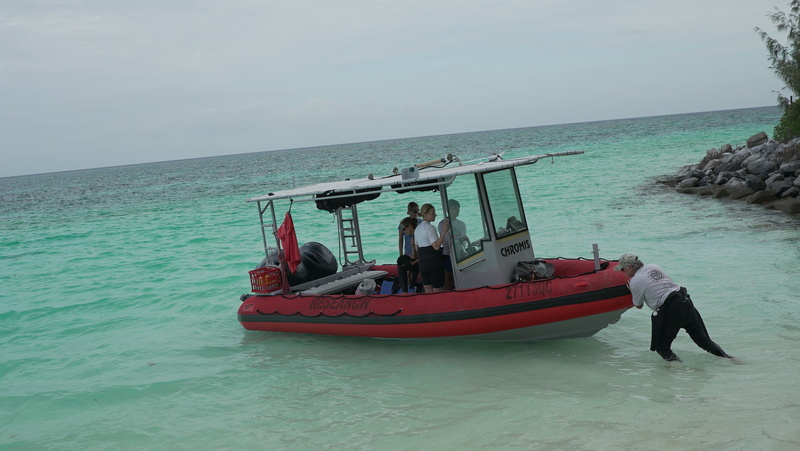 The Coral Reef Airborne Laboratory’s research aircraft collected its first coral reef data on Sunday, June 19. As the Gulfstream-IV aircraft approached Oahu from Southern California, it took a sharp right turn off the normal approach route. 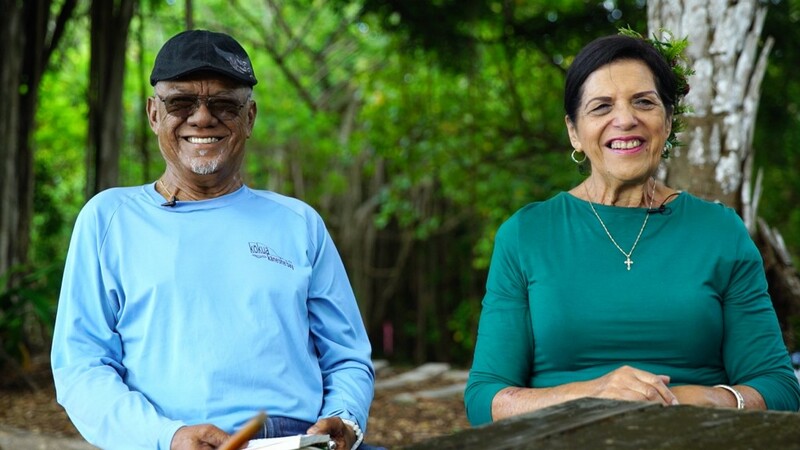 The plane flew a long, straight line above the island’s windward coast, then turned around and flew a second line right next to the first one, like lawnmower tracks. As it flew, NASA’s Portable Remote Imaging SpectroMeter (PRISM) collected spectral measurements, light reflected from the Oahu coastal waters below the aircraft. Gierach gives an overview of the CORAL campaign’s research aircraft and the PRISM instrument. 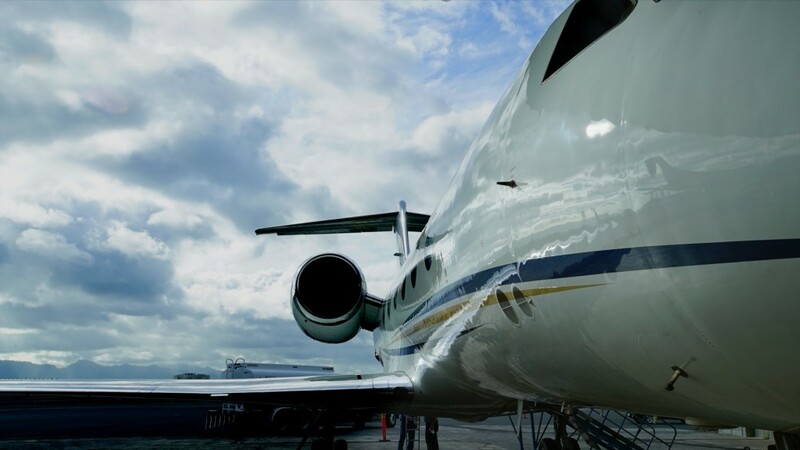 PRISM flies on a Gulfstream-IV from Tempus Applied Solutions. The plane’s Hawaii base for the CORAL flights is Air Service Hawaii at Honolulu International Airport. Diaz, Nolte and Gierach examine PRISM’s peephole beneath the plane. The instrument records the spectra of light reflected from surfaces below the plane. 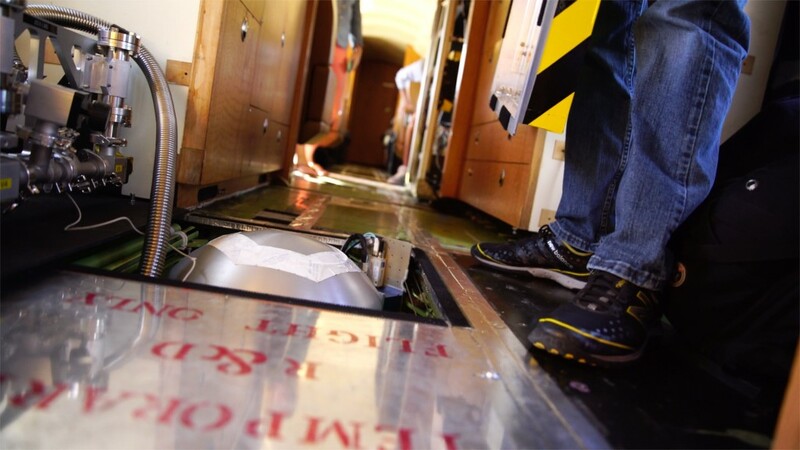 Looking like a very large teakettle, PRISM is recessed into the floor of the plane. After a successful test run in Hawaii the instrument will be used in the CORAL campaign to collect information about coral reef ecosystems across the Pacific. 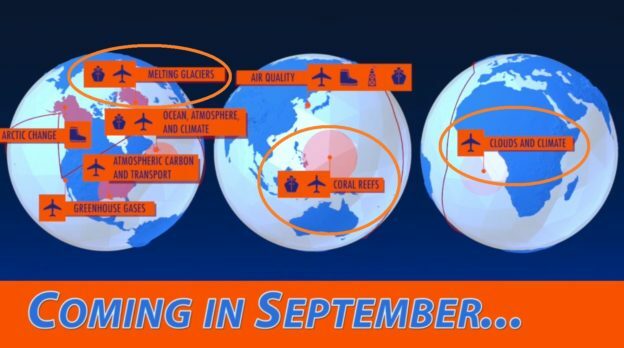 The Coral Reef Airborne Laboratory (CORAL) will be the first campaign to study coral reefs at an ecosystem scale. 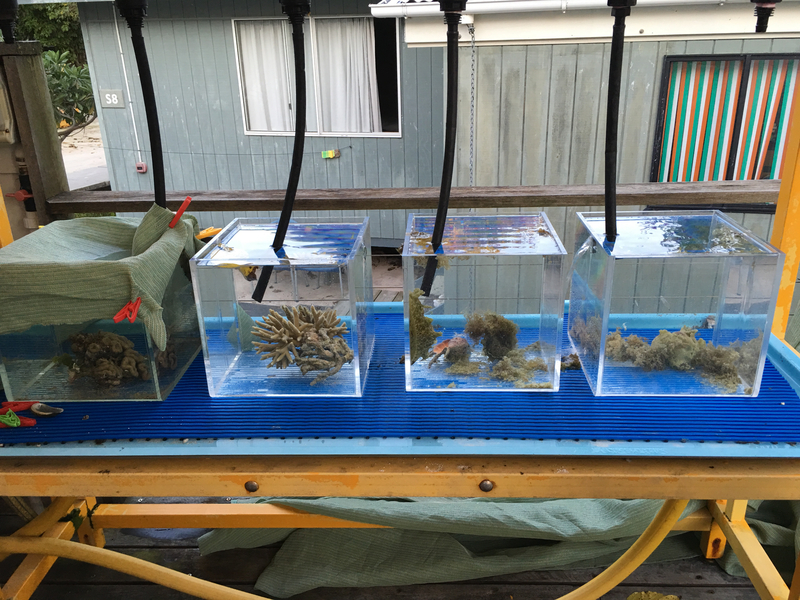 During its operational readiness test in Hawaii last week, we had a chance to talk with two people who have made a lifelong study of their own coral reef in Kaneohe Bay, Oahu, where the CORAL test is taking place. There’s a striking similarity between their observations and those of the CORAL scientists. “Did you know this used to be called Coral Gardens?” said Leialoha (Rocky) Kaluhiwa, gesturing at Kaneohe Bay. At low tide the bay still looks like a garden, with varied shades of green and patches of coral like ornamental shrubs. 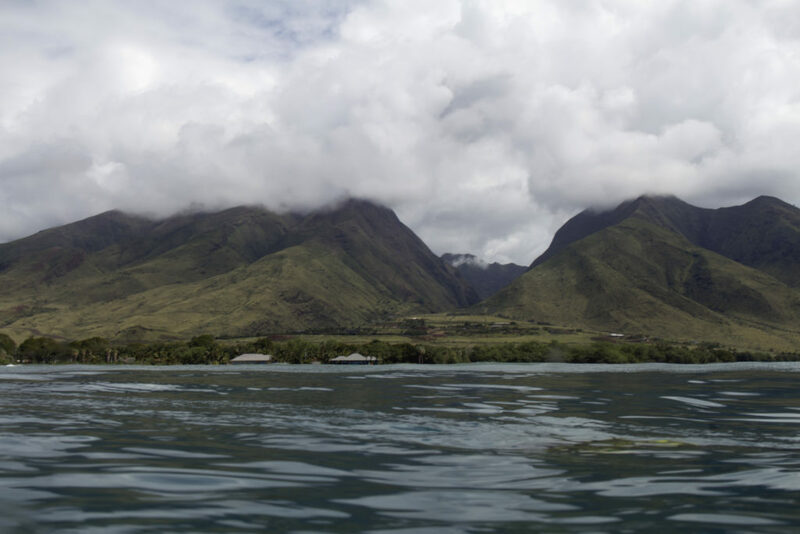 In Kaluhiwa’s long lifetime, Kaneohe Bay has undergone a litany of impacts, from dredge-and-fill operations to a level of ocean acidification that some scientists predicted would kill all of the reefs. Yet the bay’s coral reefs appear to be surviving these insults, perhaps even growing in extent. 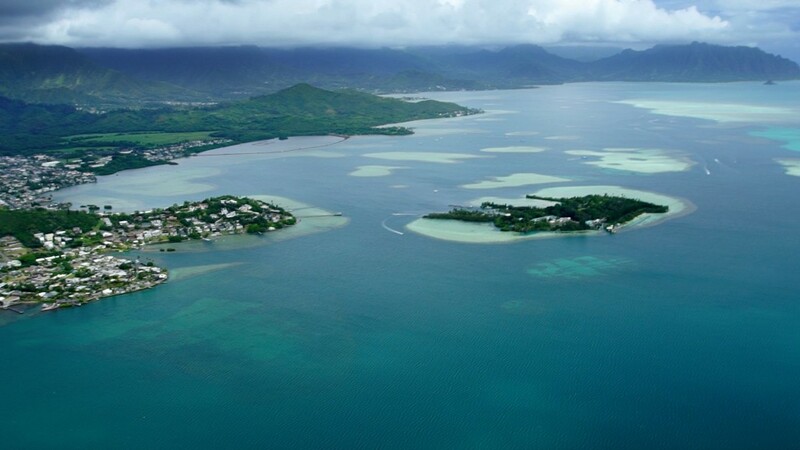 If one spot on Earth could prove that scientists need a better understanding of reef ecosystems, Kaneohe Bay is it. Humans started changing the bay about 700 years ago by fishing and other interactions, but in the last century, the rate of change has exploded. After World War II, Hawaii’s fast-growing population brought urbanization, pollution and silt runoff. The bay was dredged to create a ship channel and seaplane runways and filled to build out Moku O Loe island, then privately owned but now the location of the Hawaii Institute of Marine Biology. Invasive algae spread so thickly in the 1970s and 1980s that two barge vacuum cleaners called Super Suckers are still used to remove them. “Reefs that are doing well can recover from stress or disturbance by increasing the amount of coral,” said CORAL principal investigator Eric Hochberg. He has seen this pattern not only in Kaneohe Bay but in other reefs around the world. 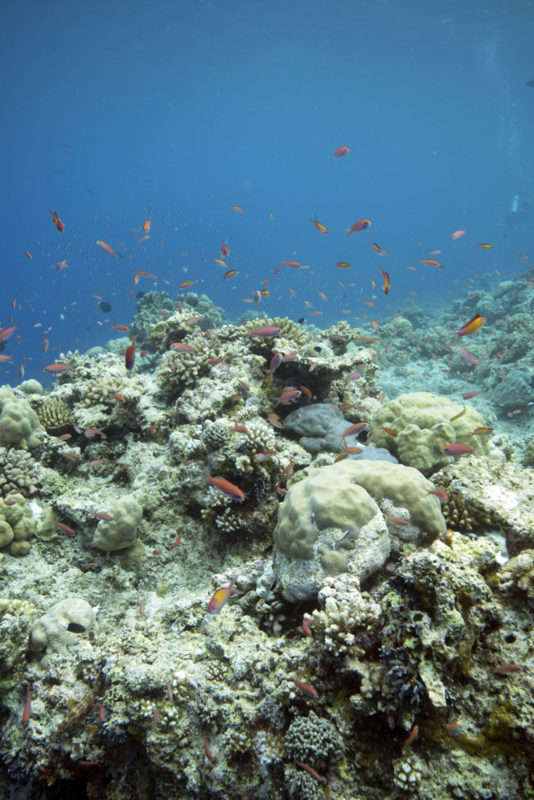 It’s only one of many puzzles of how reef ecosystems interact with their changing environment. Like Hochberg, the Kaluhiwas are more concerned about the reef ecosystem than about any single species. “Coral is not only the coral alone,” Jerry said. “If you lift the coral up and look underneath, you can see oyster shells, clams, octopus, all the small fish, hiding between the branches.” The Kaluhiwas know the value of a thriving ecosystem in producing food and revenue and even have some experience with medical use of reefs, a hot area of biotechnology research today. Rocky remembers her great-aunt using powdered coral in compounding traditional medicines, but those recipes are now lost. “Absolutely we should be worried about threats to reefs, but it’s not as simple as some people think it is,” Hochberg said. 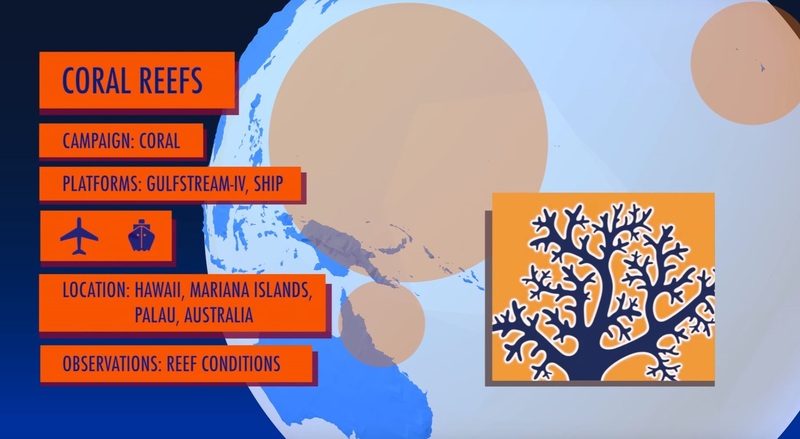 “We don’t know the answers yet.” The reef areas that CORAL will survey this year encompass every reef type plus a range of environmental conditions that scientists have identified as influencing reefs. With those data in hand, scientists may finally be able to say more about the relationship between reefs and threats that is so puzzling in this beautiful corner of Oahu.